Cut, Fade, Zoom, Wipe, Slide, Fly, CrossZoom, FlyRotate, Cube, CubeZoom, Vertical Wipe, Vertical Slide and Merge transitions available with 4 customizable transition buttons for easy access to your favorite effects. Easily add and edit a Title or ScoreBoard from the many built in templates or build your own using any Graphics or Vector editing software. Adjust Text, Font Size and Color and Real-Time with instant updates. Audio Mixer allows you to easily keep track of all audio sources and includes the abilityto Mute, Follow (Auto Mixing) and Delay any source. A VU Meter is also included with a peaking display to ensure each inputs level is broadcast ready. Connect vMix to your favorite NDI program or device such as Caspar CG, NewBlue Titler, Adobe CC and many more. multiple camera angles & instant replay. Providing your live audience with a large screen for viewing is very important for most sporting events. People rely on this if they don’t have a great view or if they want to see instant replays. With the advent of instant replay and video decisions, having live playback of the event is crucial. 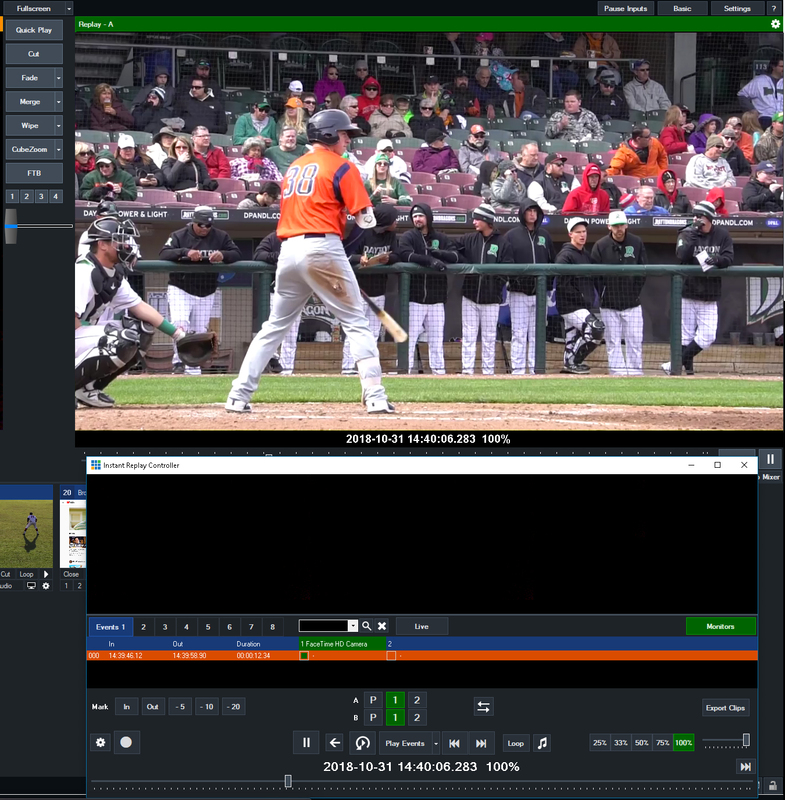 vMix enables users to create professional live instant replay for 4 camera angles! This is great for live viewers and can also be used in a video referee system or review process. This takes your normal live sports production to the next level! Streaming live sports has grown in popularity over the past few years. vMix allows you to bring a worldwide audience to your club and sport! Using vMix you’ll be able to create HD streams that can be seen by fans both locally and all over the world! What better way to build a fanbase then to give them access to every minute of every game! The recording on live sports is great for post-match editing and creating a highlights package. These recordings can be fully edited and then uploaded to the Club’s website or Youtube channel. Instant Replay with 4 Camera Live Playback! vMix PRO allows users to record 4 camera angles for Instant Replay and then play back those clips in the live production! Those clips can also be used to play at half time for a highlights package or exported for use on social media. Using vMix Social, you’ll be able to have fans interact at the game and through the live stream. Create and game hashtag and start displaying those tweets from people watching the game.